Hats on Second Life are somewhat hit and miss, often the hat in theory is much better than what you end up wearing on your head, and if this is the case with ladies hats it is a hundred times more so with mens hats but there is a well kept secret that I am going to let you in on. 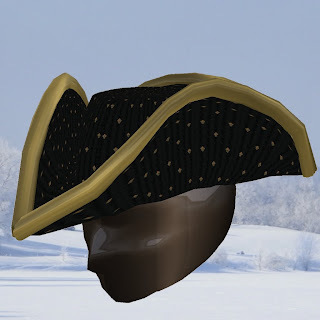 The remarkable hats made by Mr Whenever Timeless, not only are these hats beautifully made with fine textures, they hold an extra special suprise, they are scripted. Ahh, I hear you say, a scripted hat, so what? 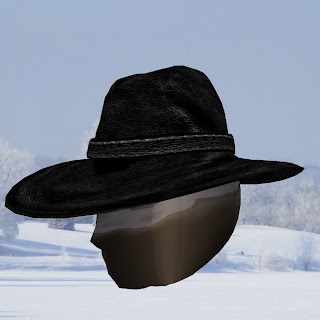 Well these hats allow you to lift your hat to a lady, and there are several version of the "tip" so you can give a casual tip, a lift of the hat or a full bow, just like a real, old fashioned gentleman! The range is constantly expanding, but it is a slow process as Mr Timeless has very high standards and is painstaking in his work. 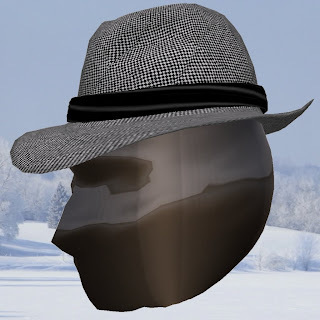 Good gentlemens hats are rare even in real life, but thanks to Mr Timeless they are now available in SL. 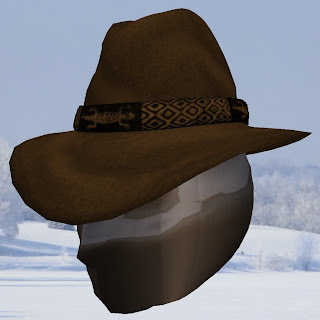 Firehorse Rearwin: You have been Miss Virtual world for a month now, what has surprised you most about your new role? Mimmi Boa: At first i want to say "Thanks" to you and to all the staff of your newspaper for this interview, I appreciate your interest! To answer your first question, I can say that after the first "astonishing moments" where I realized what was happening to me I started to work a lot to promote the imagine of Miss Virtual World as the organization required. So I had some photo sessions and interviews. After the election my life has not radically changed, I still do the things I did before: I teach, I model and I do my best to join every important fashion event. I'm proud of my role and title and I will do my best to be a "cool" Miss! FR: What are your ambitions for after your reign as Miss Virtual World? Mimmi: My ambitious is to keep my name one of the most reliable one in the fashion world in the meantime an "inspiration", a "role model" for all the aspiring models. FR: What prompted you to enter the contest originally? Mimmi: The "rumor"around the most prestigious beauty contest of the grid is enormous and I joined it for curiosity, just to try! At the time I submitted my entry to the organization (March 2008) I was an appreciate model with a good look so I told to myself to join the contest could be a good opportunity to be more visible; I'd never imagined I'd be here now talking with a journalist as the reigning Miss Virtual World! When I was chosen as pre-finalist and then as official finalist I couldn't believe it !!! To be a finalist was meaning for me just itself a victory! Firehorse: How did you choose the fabulous outfits you wore for the contest? Mimmi: When I was chosen as official finalist I asked to my friend Sissy Pessoa, owner and designer of Baiastice to create for me a special dress. She realized for me the incredible outfit I wore for the ball of Miss Elegance; a stunning pink unique dress very elaborated with a special design and a fab texture! Edo Tone and Mami Jewell (of Styles of Edo) designed my "country" gown. After a briefing together we had a great idea and Edo did a kind of "miracle" replacing on the texture of the gown a particular of Michelangelo's masterpiece "universal judgment." . The result was spectacular, Mami Jewell designed a simple but impressive gown and the texture gave to the dress the meaning I wanted to represent my country. Italy, is art, history, beauty, so I thought Michelangelo could be the symbol of all this meaning and the public was surprised and shocked about my choice but the impact was exactly what I expected! 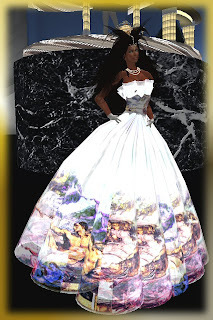 We called it "the Universal Judgment gown" the success was incredible and Mami jewell had tons of request for selling the same gown but is one of a kind and it will remains the only one on SL. Talking about the "formal gown" I had to wear a special release from a famous designer but for unfortunate RL issues they couldn't deliver it to me on time. I was really in a hurry with time and despite my inventory being full of beautiful dresses I was looking for something "special". I visited lot of places, with a big mess in my head but nothing was enough good to convince me. I decided to try in the store of AnaLee Balut, a cool designer I love and I found it. Was love at first sight! When I saw the "Mata red" dress I knew it was my gown, I matched it with the "Hillary"pink corset and the result was the one all you know: a symphony of pink, oranges and salmon tones for something really stunning beauty! ! FR: Do you have a favourite SL designer? Mimmi: I have several designers I love and I usually mix different pieces from designers to create something special. I'm testimonial of "Azul" the brand of Mami Jewell and of "Anubis Style" and I love them. As I wrote I love the style of AnaLee Balut, Baiastice, LeeZu Baxter, Indyra Originals, Paper Couture, Bianca Foulon,Thera Taurog, Bliss couture, Patrizia Blessed and more...more...more!!!!!!!!! 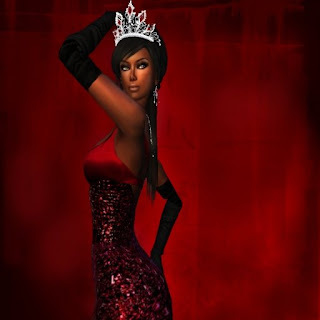 FR: So far, what has been the best thing about being Miss Virtual World? Mimmi: This is the most important title we could ever win and the best thing is the prestige itself and the honour to be Miss Virtual World. And as you certainly know, it was not only the beauty voted on by the judges but an ensemble of things: elegance, attitude, behaviour; this means all the hard work I did the last year was recognised and I feel full of joy and pride! Miss VW was surely "The event", the best event SL ever had and to be part of it was just an incredible honour for me and for all the other girls! FR: In what ways does your virtual life impact your First life? Mimmi: My busy virtual life took me out a bit from my RL life but I love my SL and all I do is done with joy and enthusiasm! I work a lot in my RL and I log in my evening after dinner; I have more time during the week end! Sl is a way to take a breath, a place where you can have your wish come true, the place where you can show your best skills. I have two separate lives and if in my virtual life i'm a very known model and the reigning Miss Virtual World, in my first life I stopped modelling a lot of years ago. I sing with my (country rock) band and I also have a "serious"job in a pharmaceutical company! FR: Do your SL friends treat you any differently now that you've won the title? I'm the same Mimmi as before so nothing is changed between me and my friends! If somebody is envious ...her/his problem! FR: What will your responsibilities be during the next year? Mimmi: The responsibility of Miss Virtual World will be to represent herself at the best . 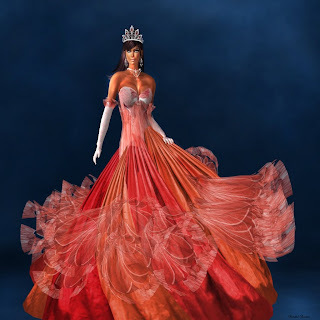 Miss Virtual World is the iconography of class, elegance and attitude mixed with good behaviour and savoirfaire and I will do my best to be a special Miss, working hard to keep higher the expectation of the organization. FR: Do you find you get asked to dance more often or are partners put off by the beauty queen title? Mimmi: People know I'm happily married in SL (for almost one year) and I must say all the people respect this status! My life is not changed after I won; I still have fans, I still have people who call me to ask if I'm faithful to Salvo....but was the same also before! FR: So many women in SL get asked if they are really men, does that question ever bother you? Mimmi: Nobody asked me if i'm a man or a woman and nobody bored me with this question. We all know many SL women are men in RL ( and some men are women....) and this doesn't impress me so much because every person is free and I respect everybody! In some part of the world homosexuality still be a problem and several people use SL to take out their real soul, their true personality. Is sad to think SL can be the only way for some persons to live their dream life. I respect all, I love all the nice good behaviour people and I don't care if they are a different gender in their first life! FR: If you could have anything in SL what would it be? Mimmi: Lots of money, tons of money to help who need a concrete support for their health in RL! I know money couldn't give us happiness....but they can help to have a good hospital, the best medicines and assistance. I have heard too many sad stories........ I would like to give them a hope and a smile again! 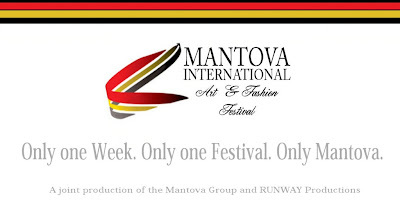 RUNWAY Productions would like to include extend an invitation for you to visit and experience the 2009 Mantova International Art and Fashion Festival. The Festival will begin on Monday, January 12, 2009 at 12 pm and run through Friday, January 16, 2009. The festival will be a week-long celebration of art and fashion from the international design community and will be held at the Mantova sim and sponsored by the Mantova Group. The festival will feature daily two fashion shows at 12 pm SLT and 4 pm SLT each day, with live entertainment interspersed throughout the day. There will be a dance court and romantic walk for nightly dancing and socializing with live DJ each evening at 6 pm SLT. The entire premise of the festival is to bring the international community in SL together and harmoniously present a forward look at art and fashion in Second Life. For more information, visit our website at www.runwaysl.com/blog. The LeeZu Baxter Designs label has had a name change. The design house will now market the creations of LeeZu Baxter under the brand name LeeZu! LeeZu! 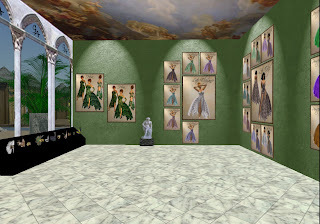 Is one of Second Life's top fashion houses showcasing the work of noted fashion designer LeeZu Baxter and her team of highly skilled professionals. The instantly recognizable clothing and accessories are noted for their complexity, femininity and creativity. The majority of LeeZu! outfits are created on multiple layers so the ability to mix and match is one of the hallmarks of this famous label. Now two years old, the company, formerly known as LeeZu Baxter Designs, is located on the To The Nines Island in Second Life. LeeZu! also operates several satellite stores in select high-end sims. The designer offers items from formal wear to casual and everything in-between. Also available is a line of accessories, eyes, shoes and jewelry. LeeZu! has received a great deal of media coverage for the specialty lines Revolution and Noir. The LeeZu! team consists of Suzi Phlox; Barbara Nicholls (store manager); Poptart Lilliehook, (marketing director) and Olyvia Zenovka (top model and model manager). LeeZu recently launched a new brand of footwear in partnership with Enktan Gully of Enkythings. Courtisane is a high-end line of exquisitely detailed shoes with rich luxurious textures. The store is located on an adjacent island easily reachable from the main LeeZu! store. The Courtisane brand will remain unaffected by the name change of Leezu Baxter Designs. 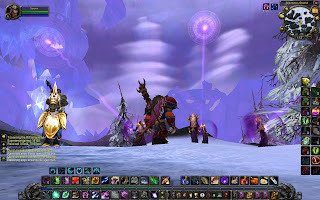 It’s been about two months since the second expansion to World of Warcraft, “Wrath of the Lich King,” came online. Much anticipated for over a year, the update for the popular online game (and Second Life’s biggest competitor) was finally up for sale on November 11, 2008. News stories showed people waiting in line at midnight for the game. I myself waited a week before going to the store to get a copy, which had a down payment from a gift card a friend gave me with the request that it be used only for it. In Second Life, for about a couple weeks, the parties I went to were smaller. Although there was a fantasy con at the time, people suspected certain people were indulging just about all their free time into the game. Some certain others I never met at parties on my friend list were also absent. Perhaps it was just simply their time to take a break, perhaps not. But very few were willing to admit they couldn’t break away from WoW for a little time on SL. As some residents of Second Life won’t, or no longer will, touch WoW, they were probably wondering just what was the fuss all about? In the days leading up to the expansion, I began getting a lot of updates from Blizzard. Most meant little by themselves. Some were minor tweaks of the game. One big tweak was an update that came with another Profession available for characters: Inscription. Using inks obtained from herbs, Inscriptionists can make scrolls (for small combat bonuses), and make glyphs that give characters lasting combat bonuses, major glyphs giving obvious improvements, and minor ones more about convenience. I later read in WoWwiki that Inscription is available to those who don’t get any expansion, but in order to get a high skill at it, one needs “Lich King.” Then came the “Achievement” records, which would ring out to you, those nearby, and your guild when you did something notable from beating a dungeon, to finishing your 500th quest, to exploring a region, to learning how to ride a mount. I found it to be a nice little touch, as it gave one a sense of progress. But something else was going on. A unique event went on, strange platforms appearing around certain cities and some other areas, with Scourge (one of the major groups of bad guys) appearing underneath. Special quests had players investigating and going after them. After some days, not long before the expansion was up for sale, the platforms and their deziens went away. Buying the expansion, my one Lvl 70 character could start leveling again, with the chance to rise to 80. He also had access to a new continent, Northrend. Arriving at either the Borean Tundra or Howling Fjord regions, players will face stronger enemies and more powerful beasts, and more quests for glory. The opposition and quests get harder as one works his or her way into the frozen continent, leading ultimately to the Lich King’s fortress at Icecrown. One amusing series of quests involves an organization named DEHTA, a parody of real-life PETA. A new class of character has been introduced, the death knight. A hybrid “tank/DPS” class (aka a combination of able to take a lot of damage and able to cause a lot), Blizzard calls this the first of it’s “hero” class characters. To play one, one has to have a character at least Level 55, which the death knight starts out as. Death knights can be of any race (although a gnone death knight is liable to get chuckles wherever he goes). The first series of quests for the death knight tell the story of how the character goes from being a minion of the Lich King to once again a hero, as well as providing the character with good armor and talents for the talent tree. Once the chain ends, the character’s path is as open as any other. Two new battlegrounds have been introduced. And in these and some Northland quests are some siege machines which characters can pilot. In the new battlegrounds, these machines can destroy walls and buildings, meaning one cannot just simply wait out enemy fire from the supposed safety of a structure. There are new mounts, armored bears and mammoths. There are also a few vehicles introduced, such as flying carpets and the Mechano-hog, a motorcycle mount. 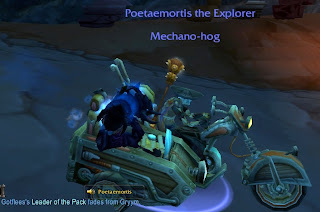 A motorbike in World of Warcraft? Even the license plate is “PWN.” On a design note, mounts also no longer take up space in one’s inventory. 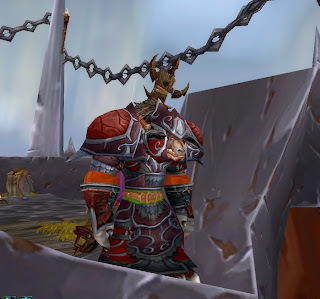 I myself have only seen a small part of Northrend and got my most powerful character from Lvl 70 to 71, and starting up a death knight, not being as active as some friends of mine. Others quickly leveled up to 80. The most ambitious players were able to reach Level 80 in just a few days. Although there has been a little complaining about boredom, more often players are able to find something to do in Blizzard’s new battlefield, at least those whose chat I’ve been hearing. Many SL residents still look down on World of Warcraft, or at least say they’re glad they no longer play. Second Life in contrast is almost never mentioned in WoW unless I bring it up. A few players did express interest when I talked about it. One who tried if before and quit told me she might be inclined to try it again someday, but only when it was no longer so full of bugs and lagging. In any event, I’ll continue going about Second LIfe as usual, while making an occasional run to Northrend, working my way to that one day me and my buddies will face down the Lich King and show him who’s boss. Even then, my journeys there will be far from over. Not long ago edo launched his range of shoes and also the beautiful pearl collection of ladies jewellery. I must admit I am a huge fan of edo's suits and to me a man is not complete unless he has at least one - preferably more of his suits but being in business myself I have long bugged edo to think about making a suit for the ladies. The Elegant suit in red is absolutely divine with a soft textured look both jacket and pants show edo Tones skill with fabric. Both suits feature pearlised buttons and come with both normal waist or low rise plus as an added bonus on underpant layer so you can wear them with boots - a definite bonus! I do know there are not many GOOD ladies business suits out there and edo is the master. 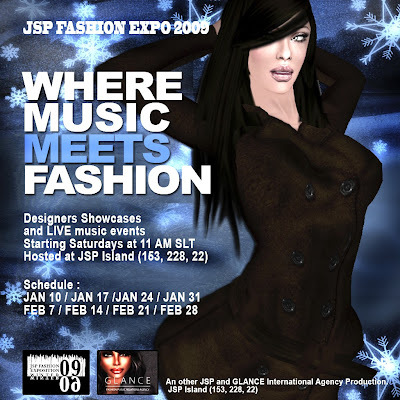 After their successful partnership for JSP Artist & Fashion Expo 2008, attended by well over 15,000 residents (verifiable statistics), Eric Coiffard and Patty Cortes decided to renew the contract established between Just Soul Promotions and GLANCE International Agency to produce together a Winter 2009 Edition of the fashion exposition.Starting on January, Saturday 10th and going on over the next 7 weekends, GLANCE International Agency will host a fashion show on JSP Island every Saturday at 1 PM SLT in-between two LIVE concerts. The LIVE musician Dominick Manatiso and the super trendy fashion designer Kaddan Yue are the first artists to kick off the grand opening of the New Year edition of the fair. "I am very happy of the stats and having heard of their reputation for professionalism and smooth fashion shows, I knew Glance International Agency would handle it the best way." Eric Coiffard commented. During the six weekend celebration the CEO of Just Soul Promotions Company had to expand his mall and is now happy to offer more fashionable shops to the crowd eager for outstanding LIVE events and unique runs. As a result of this new partnership, GLANCE International Agency will no longer be hosted at its actual location, and all the existing buildings will be removed by the 6th of January. GLANCE International Agency decided to focus on its upcoming projects. The new fair starts on the 10th January... Be there at 11 AM SLT! GLANCE International Agency and JSP would like to say a big thank you to the designers of Little Fish (Fionay Dill), Marinoco Fashion (Marinoco Oceanlane), Luminous Designs (Lumina Elvehjem), JetDoll (Kitty Pidgeon), Chez Gabrielle (Gabrielle Gateaux), 7th. Street (Px Smit), My Precious (Agnes Finney), Muze (Muze Rayna), Bland (Chav Paderborn & Rachel Breaker), R&K (Rikimaru Darkstone & Kleopatra Rives), Wildcatz (Nakitta Nightfire) and a special mention to the brand born in 2008 who worked with us for the first edition of JSP Artist & Fashion Expo, Ezura FreeStyle (Ezura Xue). We all wish them the best of luck in their creative career for 2009! Special credits go to Sanders Beaumont (incredible video! ), Kira Ahn, Miu Edman, Cerra Denja, Suri Christen (awesome flyers designers and events photographers, thank you again! 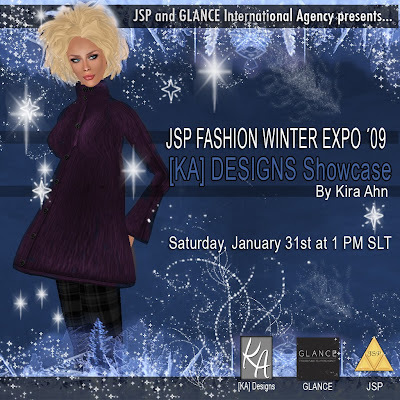 ), GLANCE Lead Model and Head Manager Kurvy Rhode and all GLANCE Top Models featured in the last JSP Artist & Fashion Expo 2008.